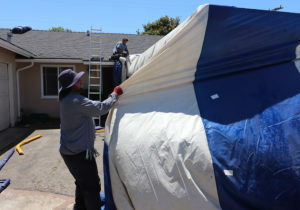 Tent fumigation is usually the best solution getting rid for Drywood Termites. At Mojoe Termite, we offer a six-year guarantee for our tent fumigations because they are highly effective at eradicating all the Drywood Termites from the structure. 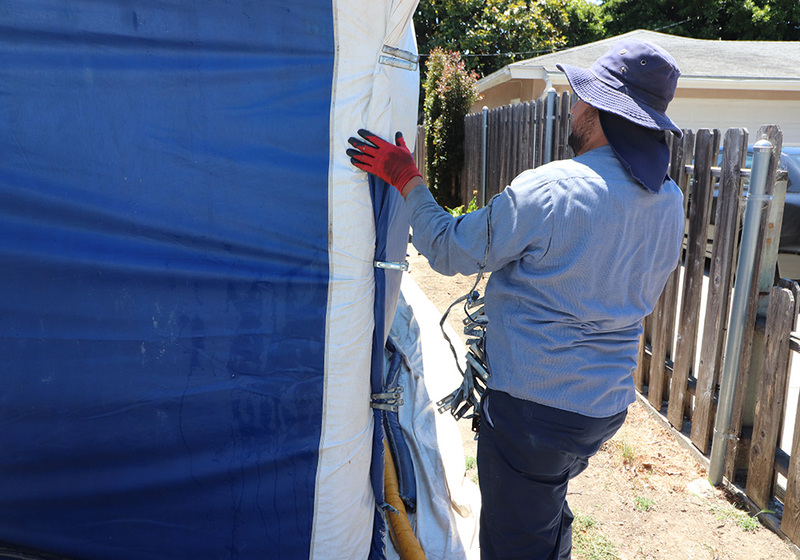 If your home or structure has several areas of termite infestation or if an area of infestation cannot be reached for local treatment, we strongly recommend tent fumigation. 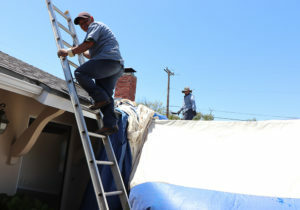 The treatment involves using canvas tarps to cover and seal the structure before introducing Vikane Gas Fumigant (Sulphuryl fluoride) into the structure. The gas penetrates the wood to eliminate the Drywood Termites within the structure. Termite Fumigation takes three days. 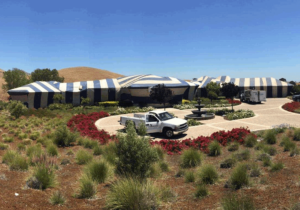 The easiest time to do a tent fumigation is when the home is empty. Whether the home is empty or occupied, there are steps the homeowner must take in preparation for fumigation. Our termite inspection team will go over those steps with you and provide you with a Checklist as a reminder. 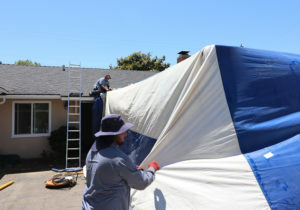 The fumigation crew covers the structure with tarps and secures the tarps with “sand snakes” placed at the foundation of the structure and other areas as needed to contain the fumigant. A licensed fumigator ensures the removal of food, drugs, plants, people and pets and makes sure that doors and drawers are left open. The crew secures entryways and posts warning signs. 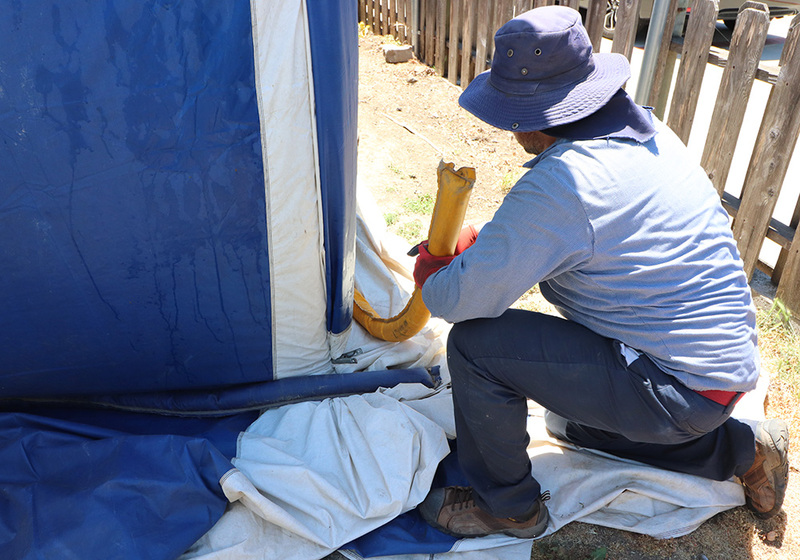 The fumigator applies warning agent and introduces fumigant into the tented structure. 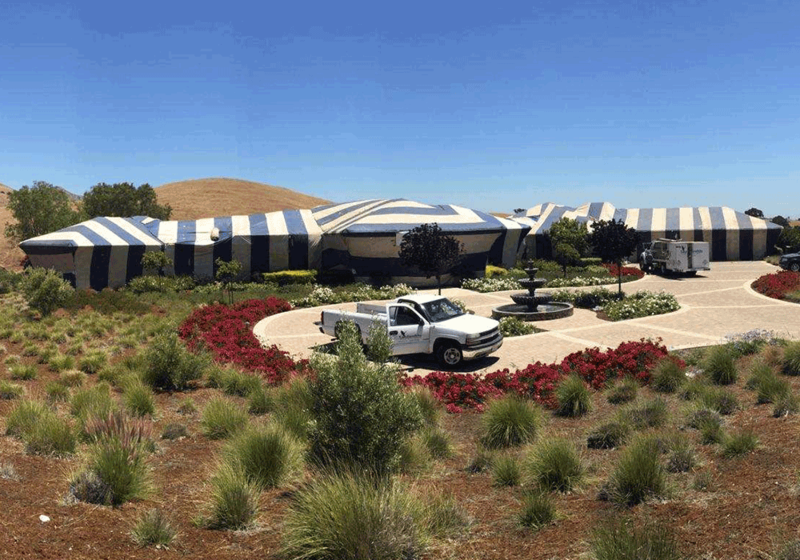 Fumigant is contained within the tented structure for a predetermined period of time. The crew removes the tarps from the structure. The licensed fumigator opens all windows and doors and uses fans to aerate the structure. The crew again secures the property with secondary locks and warning signs. Once the structure had been allowed to aerate for the proper period of time, the licensed fumigator uses equipment to sample the air from the living spaces of the structure. When the fumigator determines that it is safe to return to the structure, the secondary locks and warning signs are removed and a Re-Entry Notice is placed on the front door.